I know this will likely be one of thousands, possibly tens of thousands, of blog posts regarding the passing of Apple co-founder and figurehead Steve Jobs yesterday. Jobs passed away at the age of 56 after a long battle with cancer. Unlike many other posts, however, I’m not going to recount a biographical essay of Jobs’s life or historically chronicle his time with Apple. What I want to look at is what he gave us and the legacy that will continue even after his passing at such a young age. When I think of Jobs, the word that most comes to mind is: visionary. This was a man, whose sometimes ego-maniacal persona in regards to business, pushed products that were from the deepest points of his imagination. Unlike many other companies whose primary creative decisions come from a web of corporate “suits”, Apple’s vision was dreamt largely from one mind and then implemented by the many departments of the corporation. During his tenure at Apple, the company continuously released products that were 2-3 years ahead of their time, paving the way for the next generation of media consumption. Since 2000, Apple has strategically eliminated nearly every form of popular tangible media. With iTunes and the iPod, mp3’s have taken over the compact disc market; with the iPhone, the first integrated touch sensitive smart phone with heavy application reliance revolutionized the cell phone market; and with the iPad, tablet hardware has come to a forefront, replacing the laptop computer in many homes and just now is becoming a favored educational tool for schools around the globe. For the first 20 years of home computing, advances were minimal in design and functionality of the systems. However, in just over 10 short years since Apple’s introduction of the iPod and all-in-one iMac computers, Apple has effectively changed how we interact and experience many forms of media on a day to day basis, from movies, to watching television, to music, and beyond. 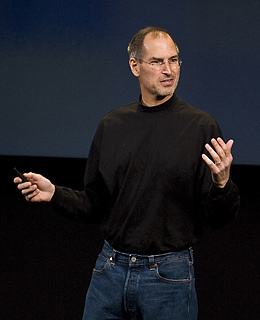 Being a hands-on entrepreneur, Jobs’ position in Apple has been crucial to its success in the world market. Under his leadership, the company grew from a secondary contender in desktop computing to the largest technology company in the world. Knowing of the severity of his illness, I’m sure Jobs has laid out a very concrete game plan for the future of Apple; one that will, hopefully, keep his vision and spirit alive, much like that of the pioneering legacy of Walt Disney. It will certainly be a lonelier place in the technological world without Jobs’s vivacious enthusiasm and keynote addresses. Yet, what he was able to show us could be done when you have a dream and a vision, will hopefully be preserved by not only Apple, but serve as a precedent for young minds and inventors to come.